● Keep your keyboard clean with this portable Vacuum Keyboard Cleaner. ● PC Vacuum Cleaner powered directly from any USB port. ● Simply connect the Vacuum to the USB port of your laptop or Computer. ● Two Vacuum cleaning attachments included-one bristle brush attachment and one flexible rubber keyboard tool attachment. ● This USB computer mini vacuum cleaner is powered directly from any USB port. ● Two switch levels-slide the switch to the first level to turn on the LED light, slide the switch to the second level to turn on the vacuum cleaner. ● Press the “High Power” button to increase suction power, for vacuuming heavier dirt and dust. 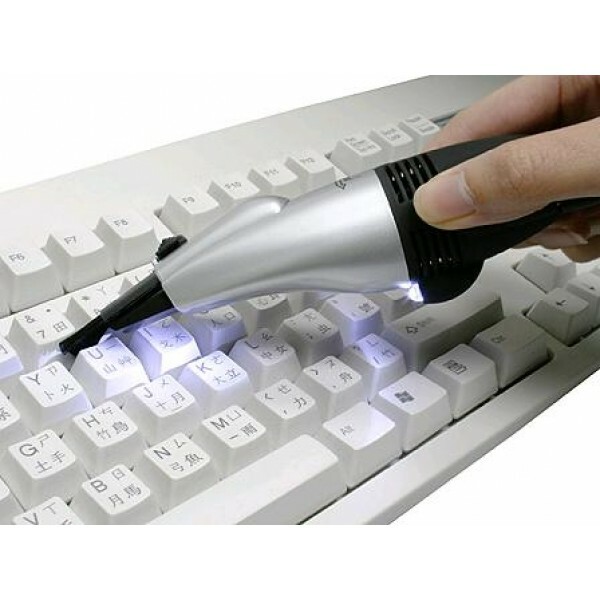 ● Use the keyboard attachment rubber to vacuum the dust and other particles trapped underneath the keyboard keys, by sliding the squeezable tube between keys. ● Use the brush & suction tube attachment for general cleaning of air vents (fan), Monitor and computer areas or dust on your desktop. ● Requires no external power source, plugs straight into any USB port.